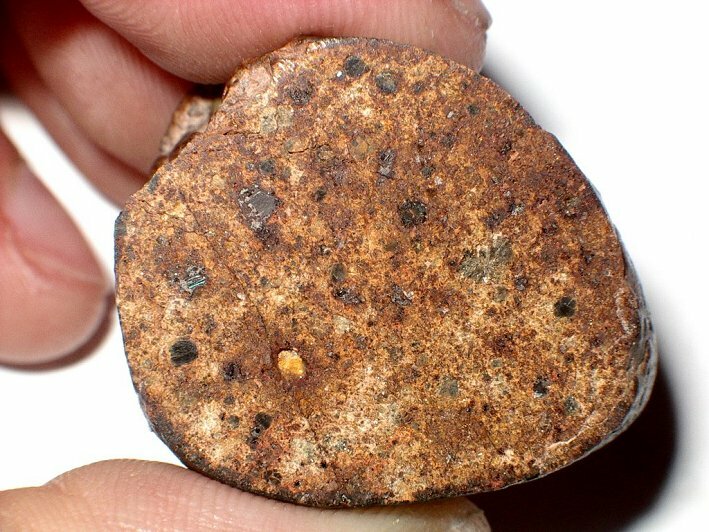 Remarks : Fully covered with fusion crust, the fair brown matrix shows some very rare metal flakes. 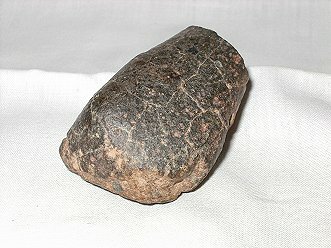 This meteorite was found as a complete individual, fully covered with fusion crust. A first end piece was cut for analysis, leaving a piece weighing 40,2g (see picture). It was cut again to complete the mass of the type specimen to a minimum of 20% of the TKW, leaving this time a 34.5g main mass. Containing almost no metal, attraction of a magnet is very low. 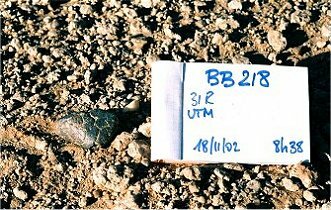 The cut section shows a fair brown matrix with very thin fair grey chondrules and very rare native metal flakes. Only the type specimen was cut and taken away from the meteorite. The cut section of the 34.5g main mass shows that this meteorite is quite fresh (W2), displaying nice chondrules and rather big metal flakes. It is a rare and gorgeous chondrite.